While I wouldn’t say that we were early adopters of home Internet service, when I started to use it in 1996, it quickly became a big part of my life. At this time, I had already been an anime fan, watching some grainy tapes at the local comic book shows, saving birthday and holiday cash for a $30 English dubbed tape from the mall and burning through my TV copies of both Sailor Moon and Ronin Warriors. When I got on the Internet and looking for anime, a lot of it involved chat rooms asking about shows I’d only seen on a shelf – to see if they were any good – rather than talking about shows I’d already seen. Given that these disks were from the period where I was hanging out online and interested in anime, they represent a time capsule of anime fandom, mostly mine but a bit of just how Internet fandom was. As I was going through them, there was a lot of other stuff still there – school work, other computer things I was spending my time on, Dungeons & Dragons stuff (because I was Mr. Popular, after all). But from the Internet, there are remnants of some things that are completely unique to the time – media galleries were mostly pictures, and if there were music or videos, they were ultra-compressed RealMedia or mp2 files. Video was sparse, only several seconds. No YouTube linking. No “like, subscribe or share” buttons! Links pages were a thing and some sites were nothing BUT links pages. And then there were the webrings. Oh, Jiminy Christmas, the webrings! Anime fandom on the Internet in the mid-1990s were usually websites of four types – those devoted to specific series or franchises, fan works, the “Character Shrine” and links pages. Often a site devoted to a single site would be composed of an FAQ, a series synopsis, image gallery and links page. Like the series site, the Character Shrine was composed of similar layouts but all about a single character in a specific series. Fan work pages were dedicated to fan art, fansubs, even fan dubs & parodies. Before the ubiquity of Google, there were many search engines (and comically human curated), all offering variances of result returns. But often pages of just link indexes, like the Anime Web Turnpike, were invaluable to a fan in cyberspace. Fans of the same series would often collectively group their sites together and form a webring. The webring would direct visitors to other member pages in the ring. Stumbling on any member of a ring would open you up to more sites to visit and some pages were members in multiple rings. While many sites, even within a webring, all had similar content layouts but the content on the site itself would be different – image galleries would have a different collection or assortment of images, links’ pages have different sites, FAQs and synopses would be in the site author’s voices. While there were a variety of Internet Service Providers one used to actually access the net, one of the most popular of the time period was America Online (AOL). AOL was different from it’s competitors because itself was a software package that did more than just connect you to the Internet – it had it’s own browser, chat messenger (the original AOL Instant Messenger), chat rooms and one of it’s most memorable features – the AOL Keyword. AOL Keyword was an indexing system within the AOL ecosystem that would bring up a web portal with links and information of what you were looking for. There was, of course, an “japanimation” listing in the AOL Keyword index. But at this point in time, Internet access was often tied to the phone system, and unless you were very well off, you often had to split time being able to use the Internet or the telephone. If you were a teenager at home like me, that meant only being able to get material online during certain times of the day. Just as now, material could be saved offline onto your “local” computer back then. While local storage now is internal & external hard (or solid state) drives or flash drives, the need for removable media then was commonly filled by 3.5-inch floppy disk. Storage then, was not cheap like it is now. A PC’s main drive was still often under 1 Gigabyte in storage capacity. Floppy drives themselves were 1.4 Megabyte (~0.0014 GB). For someone like me who enjoyed anime art to use as sketching references, I often would have a dozen or so disks devoted just to anime images. As time, needs and interests changed, disks would be overwritten as needed but I still had a few in this lot that had some of the original material I’d saved. But disks weren’t just for grabbing things offline and keeping them locally. When in High School I started running a local anime club, my other officers and I would program at least four to five months’ worth of meetings out, sometimes our entire meeting schedule in a couple weeks meeting just ourselves. With no Google Docs available to us, we often times carried files on drives with us to get the schedule hammered out. I haven’t had a floppy drive in a computer for over a decade now, so when these were dropped off, I started looking online to see how I could get data off of these disks. I found a USB drive on Amazon for less than $15 USD. Over a few afternoons, I plugged the drive in and started going through drives. A collection of sorted data stored on my local hard drive. Contents of the “Anime Stuff”. The Truth Is Out There. 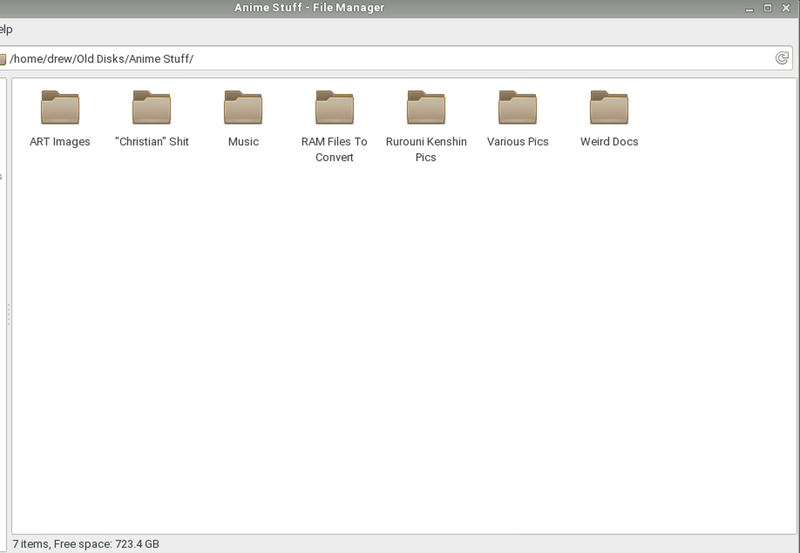 The real relics of anime fandom there is the first directory, the ART Files. ART was an image format used only in America Online, though similar to JPEG or PNG. Up until the very early 2010s, most web browsers could open these images still but now they are resigned to the dustbin of history (and specialized software). Likewise for the RAM Files; video in those days was sparse and with most subscribers’ bandwidth very limited, RealAudioMedia (RAM) was a format that condensed audio and video down to some of the smallest file sizes. Unfortunately, that format also requires conversion to be played by modern video software (and who knows what it will look like then). The Music folder straddles the past and present (in software terms). Much of its content is prior to BitTorrent and its earlier peer-to-peer networks such as eMule, Kazaa and the most famous, Napster. All of the files contained therein were hosted directly on individual websites, like Wuken’s Dragonball Listening Booth and directly downloaded. Though a few are in the familiar MP3 format, most are in its predecessor format, MP2. The MPEG format was revolutionary at the time for its high-quality and high compression rate, getting the best sounding music for the smallest file size. MP2 files fortunately use the same codec library as MP3, which means they play seamlessly in any modern player. Other formats have come and gone but MPEG sticks around and is synonymous with digital music. One relic of this period of fandom was the Internet rumor that George Bush was going to ban anime. Clearly a hoax, exacerbated by a lack in understanding that generally isn’t what presidents do, but part of a bigger trend of 80s and 90s conservatism towards media’s effect on children. Trends of kids getting into these Japanese cartoons like Sailor Moon, Dragonball Z and Pokemon left overly concerned parents wanting to know more about what their children were watching (without actually watching it themselves). While other fans were always happy to help parents out, often times parents were left without knowing fans to even ask. Many conservative churches took it upon themselves to help their congregants out with this matter – and like so much other media they “examined”, wound up with their own miniature version of Satanic Panic, casting any big-eyed Japanese cartoon not the work of artists and production companies but of Satan himself. Their research methods start off on strong footing – referencing information found on publisher’s websites or notable fan sites of the day, or relevant secondary sources – but often having a made their minds up during their research, they quickly fall into a specific interpretation of that information. I’ve exported all of the docs I saved from those times to PDF for download if interested. Outside of the relics of fandom that anime fans of this age all remember, the best stroll down memory lane for me was looking at in that old “Anime Club Stuff” folder. Part of that is because a lot of the stuff just from “Anime Stuff” is supplanted or replaced with modern stuff on the Internet – image galleries are widely improved with Tumblr, fan sites gave way to blogs and YouTube covers music and video better than we could in the nineties. But also probably because it is intensely personal to me. Nothing in the “Anime Stuff” was anything I really worked on, other than having pictures for small, personal websites. The “Anime Club Stuff” is an entirely different matter. On the cusp of the Toonami boom, I lead an anime club in a high school. At at time when most clubs were staples of universities and colleges and anime was becoming less hit or miss on American television, younger audiences were getting into anime and manga. The club wasn’t my idea – I inherited it from some graduating seniors (simply by asking). But knowing anime’s diverse tapestry of genre and archetypes, I strove to put together a wide variety of programming options for lots of people’s different tastes with the rest of the officers. We had a couple of foundation rules we adhered to – 1) School appropriateness for content, 2) Subtitled programming to at least maintain some air of academic credential and 3) Nothing that was readily available on television. While those rules gave us a lot of flexibility, it also gave us an out to decline requests. So, what was a club like ours watching from 1999 to 2002? Often in the fall, at the start of the academic year, we would often start with something rather familiar – like Sailormoon movies (that hadn’t had official releases at the time) while moving through the year with other popular but otherwise overlooked series, like Urusei Yatsura films. After the first year or so, we tended to stick to movies or short OAV series, when an experiment with Giant Robo: The Animation went by without expected results. TV series occasionally made a cut but they were often only the first few episodes that we could fit into our meeting block. Other special meetings had themes, such as Christmas episodes to round out the end of fall semester or AMV collections or Corn Pone Flicks parodies. Reviewing those schedules, it’s funny in retrospect to think that the entries in April of 2000 had Gundam Wing as a tentative placeholder because who would have thought that would have been popular or anything. Looking at anime and manga fandom on the Internet from two decades ago is a wonderful trip down memory lane for me. It is, though, part of a story that the more things change, the more they stay the same. Internet fandom of this time continued the arguments from fanzines and Usenet and shared multimedia through fan sites that is not unlike today’s blogs, forums, Tumblrs and Twitters. While there’s a lot of stuff still retained here that is a nice snapshot of those times, I think for me the more intriguing to reflect back on is the “side-stories”: hyperbolic fan conversations about wild rumors, non-hyperbolic conversations fans had about anime and those old club schedules to see what folks were watching and exposed to. Have any other items from this area I may have missed? Head on down to the comments section and leave a note!